MyCashier is a multi featured platform which helps to boost financial transactions & management for any kind of business. Have you ever thought about having a powerful POS, Invoice & Inventory System and many more all in one place, then look no further. I present to you… MyCashier. With an attractive material design, you now have the chance to get rid of those boring paper works or having to combine multiple applications to perform your daily tax. We present to you more features at a ONE time purchase price, and this project will be actively maintained even while more exciting features are added monthly. Just do us the favour by contributing into the comment section and let your feature request be known! What’s more? Not only do you get this amazing features, you also get to make money from it. That’s right! At the cost of an extended license you are free to charge end users. Okay… how about we take some time to list out the features of MyCashier. huh? Product Inventory: Basically for any kind of product or services you offer, it helps you manage your available stock and track your sales. Flexible Invoicing: You are giving absolute super power in issuing and scheduling repeated invoices to customers, fully customized with your business details. Partial payment are supported out of box and you can monitor the entire payment transaction. A well styled email which contains a table list of the items is also sent to the user. 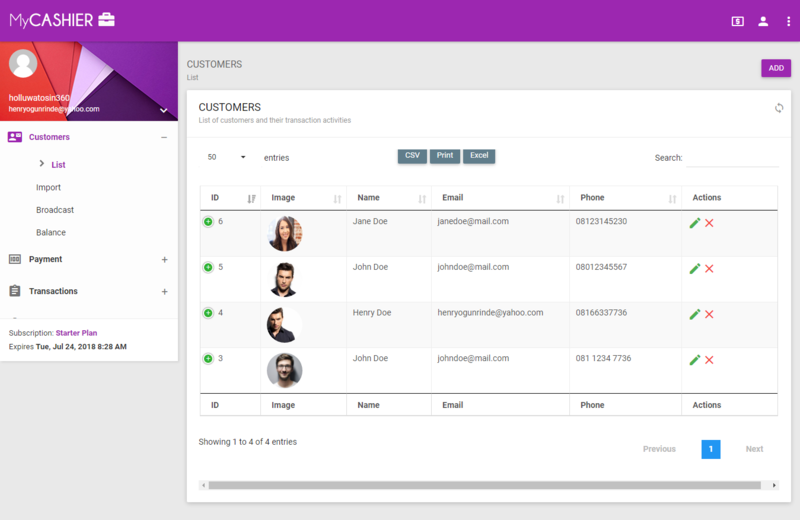 Manage Customers: This helps you get rid of any paper work of clients and customers, and allows you to manage them every where you go. 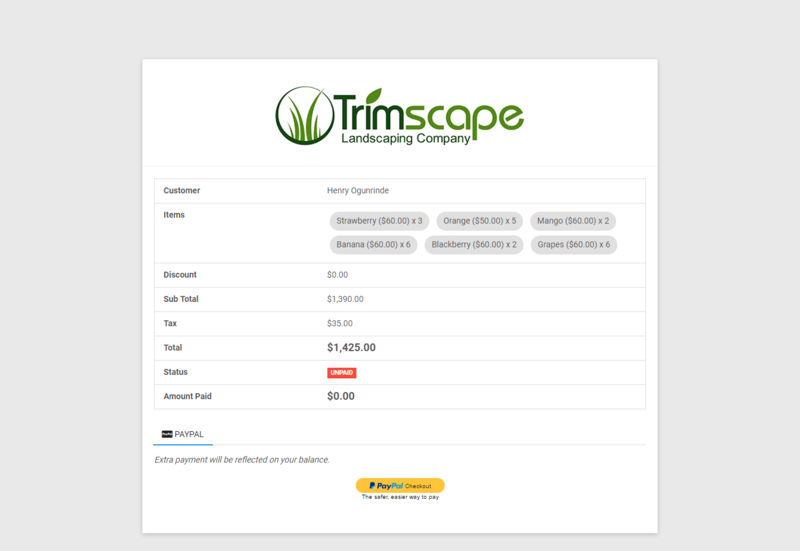 Supports customers balance tracking which could be used for future Invoice or purchase. Supports storing of customers image for easy identification. Import Data: Just in case you have an existing database of customers and invoice, we have made it easy for you to transfer it into the system using a csv data file. Locale Support: We have made support for your locale currency and all your prices are formatted using your own currency symbol. Multi Tax Support: If you are in a region where multiple taxes applies to your different products, we have got you covered. All tax charges are stated per customer transaction. Send Broadcast: This comes in handy whenever you wish to pass some information to customers. Messages are customized according to your business profile setup. 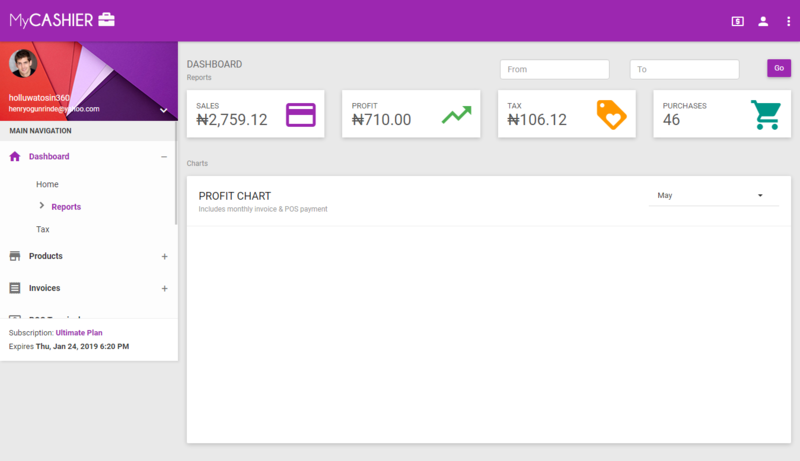 Awesome Experience: Our carefully crafted user interface is very pleasing to the eye. We guarantee you an awesome experience. Made flexible for any kind of business. Issue invoice directly from ther Terminal. You may also choose to notify customers upon checkout. Statistics Monitor: Comprehensive highlight, statistics and charts are made available so that you can easily track your progress. View purchases and tax transactions charts with ability to filter with date range. Best Industry Leader: Our service is the best of its kind and we are gradually evolving. We are open to feature suggestions, let us know how we can serve you better. 24/7 Online Support: If you have any enquiry or complaints, our online support agent is always available. We would love to hear from you. 1. We have removed the default landing page, so you may build your preferred landing/sales page and redirect it to the installation. 4. Added some widget updates to the reports page. If you need support for your language, let us know after purchasing. 5. Added date range filter into the Tax Reports.